APJ Abdul Kalam has left an indelible mark on the hearts and minds of Indians in a manner few other public figures have in recent memory. In death he achieved the kind of acclaim in people's hearts that politicians covet but may never come close to attaining. In material terms, the "People's President", it now transpires, owned precious little, save his 2,500 books, a wrist watch, six shirts, four trousers, three suits and a pair of shoes. Kalam did not own any property nor a fridge, TV, car or an air conditioner. This for a man who spent over five decades in public service, including his stint as President of the Republic. He did not die in penury, but neither did he live a life of luxury. He survived on the royalty from his books - he authored four of them - and his pension. The exact amount of his life savings is not known. "It wasn't much to write home about," said Sheridan, his secretary for over two decades. After he demitted office, the government allotted him a bungalow at 10 Rajaji Marg. The two-storey house lies desolate today but tales of his integrity are still alive. He was firm about not receiving any personal gifts and ensured that all personal gifts were duly tabulated and sent to the government's toshakhana. "He would never accept a gift, save a book, and whenever somebody brought him a packed gift and tried to pass it off as a book, he insisted on examining what was inside. Anything other than the book was politely returned," says his former media advisor SM Khan. Kalam's love for technology is well known and he kept himself abreast of the latest developments mainly through radio. "He did not have a television set in his living quarters. He got his news either from radio or newspapers. The only TV set at his Rajaji Marg residence was used by his staff," Khan said. Khan recalled how the former President revered his elder brother, who is 99 years old. Kalam held his elder brother APJ Marakia in great esteem and was full of plans to celebrate his brother's 100th birthday next year. 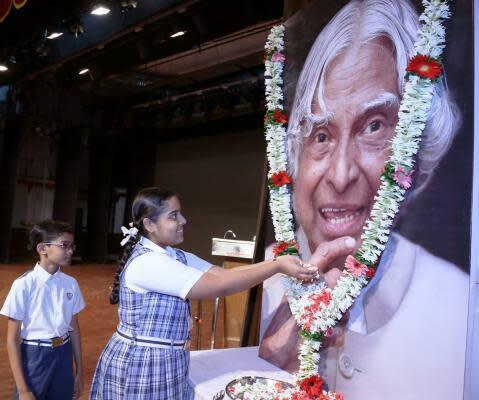 "One of the things that gave him (Kalam) immense joy was when he helped his brother get access to 24-hour power supply by installing a solar panel at their ancestral home," says Sheridan, adding, "President Kalam would always call him (his brother) before leaving or returning from an important lecture assignment. He had called him the day before leaving for Shillong." "The lives of great men remind us, we can make our lives sublime, and, departing, leave behind us, footprints on the sands of time." Former president APJ Abdul Kalam wasn't around when Wordsworth wrote these lines. Had both the men belonged to the same age then these lines would have surely been written for Kalam.